This Dark Chocolate Mocha Truffle Tart will definitely satisfy anyone’s chocolate cravings. A buttery tart shell is filled with a smooth, velvety dark chocolate ganache that is lightly sweetened with honey and kissed with coffee flavor. The dark chocolate flavor comes through the most, but adding the coffee makes the filling a little bit more complex, drawing out some of the darker notes in the chocolate. The tart is decadent, very satisfying to eat and surprisingly easy to make. For this type of tart, you need to start with a prebaked tart shell made with your favorite tart dough. I used four individually sized Vanilla Almond Tart Crusts that I baked a day ahead of time. You can also use a single 9 or 10-inch tart shell. 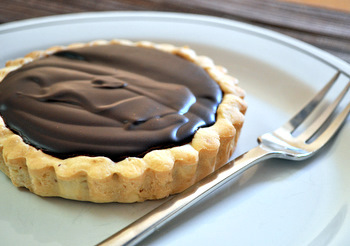 After your shells have baked and cooled, you can prepare the chocolate ganache that makes up the tart filling. Once it is ready – no further baking needed! – all you need to do is wait for it to set up before you can dig in. The ganache is made by pouring hot cream over chopped dark chocolate, honey and instant espresso or coffee powder (I used Starbucks Via). 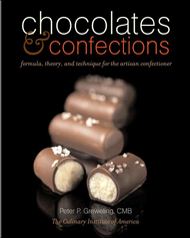 Choose a good quality dark chocolate in your favorite brand with 60-70% cacao for best results. The hot cream will melt the chopped chocolate as you stir and create a very smooth ganache that makes a silky filling for the tarts. Make sure that the ganache is still warm – you can pop it in the microwave for a few seconds to warm it slightly, if necessary – when you pour it into the prepared tart shells. After the ganache is poured into the tart, firmly (but not aggressively) tap the bottom of the tart a few times on your countertop to release any bubbles that may have formed when your poured in the ganache. 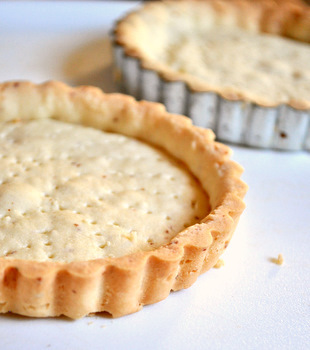 Smooth the surface with an offset immediately after pouring if you want a very smooth finish on your tarts. Personally, I don’t mind the slightly rippled look of the glossy, poured ganache because it gives the tarts a more handmade look without taking anything away from their flavor. 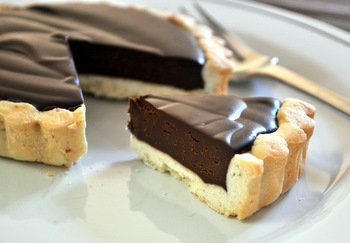 These tarts are best eaten within a day or two of being made, as the ganache will start to soften the crust slightly if they are kept longer. Serve plain or with a little whipped cream. This recipe makes enough filling for a 9 or 10-inch tart, or for four 4 inch tarts. If there is leftover filling, you can refrigerate it and shape it into truffles (or just eat it with a spoon). If making smaller tarts, do not overfill shells. In a small saucepan, or in the microwave, bring the cream just to a simmer. Pour over chocolate and stir with a spatula until chocolate is melted and the mixture is very smooth. Add in butter and vanilla extract and stir until butter is melted and the mixture is very smooth. Pour ganache into prepared tart shells (warm it for 10-15 seconds in the microwave if it becomes very thick). Chill tarts for at least 2 hours to allow filling to set. Tarts are best when served close to room temperature. Makes one 9 or 10-inch tart; or four 4-inch tarts. Note: If you just want to make dark chocolate tarts, you can omit the instant coffee without changing anything else in the recipe. This looks so yummy and perfect for Valentineâ€™s Day! You had me at “Dark Chocolate”. yes, me too… I wouldn’t have cared what you were making I would have wanted the recipe for dark chocolate fixin’s ~~I am going to leave the coffee out tho’. Happy Valentine’s Day! oh my.. both beautiful and delicious-sounding! I made the filling this morning sans coffee and it is SO GOOD! Wow! I didn’t use your tart recipe, rather a nice flaky pie crust recipe I have. However, this did not even come close to filling the pie, so next time I will be tripling the recipe. Anyway, I just wanted to let others know that this is really good. Very chocolaty and not overly sweet. Thanks so much for the recipe! Ginger – Glad that you liked the filling! I think that a flaky pie crust is a food match for the chocolate filling. I don’t know if you used a pie shell or put your crust into a tart shell, but if you did use a pie plate it is much deeper than the average tart pan is, so I’m not too surprised that the filling didn’t fill it up all the way. Enjoy the rest of your chocolate pie/tart and thanks for commenting! It’s dark chocolate ganache and a butter-filled pie crust. I want to eat it every day for the rest of my life! So glad I found your blog! Rich and decadent. Everything a Feb 14th should be….with a Valentine or not. Mmmm! With the description, ” A buttery tart shell is filled with a smooth, velvety dark chocolate ganache that is lightly sweetened with honey and kissed with coffee flavor. ” how could I NOT fall in love with this?!?! ~ yum!! If I hadn’t already made my Valentine’s Dessert (yes, a day ahead – I am that much of a holiday-loving nerd!) I’d def be getting started on these beauties. P.S I love your blog, it is just brilliant. This is better than Comfort Food..